Well, we all know what we’re going to hell in. I see a business opportunity. We need to design a basket where the handles are spring-loaded a little, such that you need to apply some force to move them from the folded down position to the carrying position. 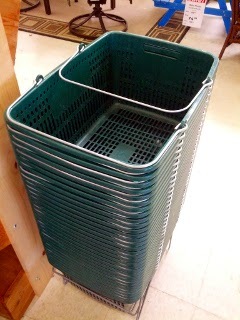 Then when you drop the basket back in the stack, the handles will snap down automatically. As a bonus, if the shopper squeezes the handles together idly while filling their basket, they get a workout a la those gripmaster things! Far more annoying are the jackasses who leave shopping carts in the middle of parking spaces when the corral for empty carts is like 15 feet away. Next PostNext Who are the real monsters?